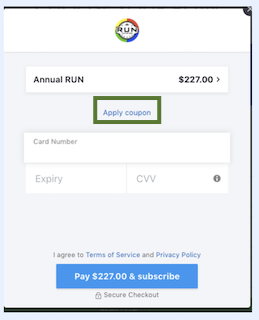 If you have a RUN coupon, here are the steps to take in order to apply the coupon. 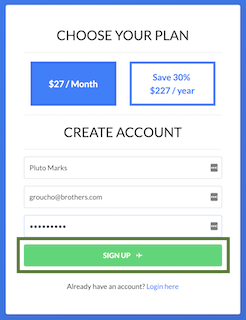 First, log in to the RUN signup page and click on the button for the subscription plan you would like to have. Complete the form to create a RUN account, providing your name, email, and password. Once you have done that, click on the green button SIGN UP. 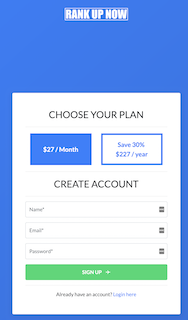 Once you have done that, the screen below appears for the subscription you chose, in this case an Annual RUN subscription. Click on Apply Coupon. Once the coupon has been applied, enter your credit card information with the card number, the expiration date, and the 3-digit CVV found on the back of the card. Click on the blue Pay button to subscribe and to complete the transaction.